Latest update 8 June 2018. About 2330 it got quite rolly, probably related to the change in tide which was about then. After an hour it was okay. We still slept well. We get up at 0800 and it is again sunny and the wind is around 10 knots. Trade Runner leaves for Middle Percy Island as we have breakfast. We also hear that the fishers finally left Middle Percy for Thirsty Sounds. We take Veto to the beach, the same little bay we used yesterday as there is still a little wave breaking on the beaches. We also have a swim, we have not had a shower for many days. We are much refreshed! When we get back on board, we hear the border protection plane (or whatever they are called this week) call three boats. We think one was the US boat Quester and another was Trim the Cat which we saw on AIS when we were last in Airlie Beach. No idea why they need to call the second boat as his AIS should be visible and they can check records using that. We leave South Percy at 0915 and sail towards West Bay, Middle Percy Island. We use the screecher and except for a few short bits, we sail all the way till we are near the bay. We motor the last bit and anchor at 1115. Soon after, Trade Runner leaves, we think they must have decided to head south early. We go ashore for a short time. 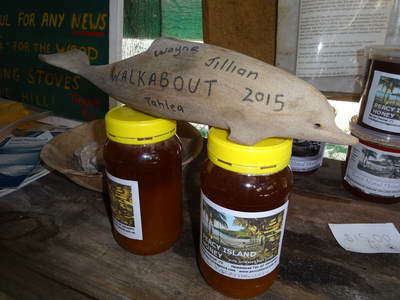 We purchase another Percy Island Honey (a large one for $15). Trim the Cat comes in just before this and we talk to the owner, Mark. He says that the border protection plane called him 20 minutes after they flew over him. Back on Catlypso, we decide to replace the pulley on the mainsheet system. This is the one that had some ball bearings fall out about a week ago and which we found on the cockpit floor not knowing at the time where they came from. We also end for end the sheet which puts a better quality rope in the important section of the pulleys. After lunch we take Thunderbird 2 to the lagoon and then we walk to the spot that overlooks Rescue Bay. This is where you can get mobile phone coverage (if you use Telstra). We take our netbook and update this website with text for the past four days and check our emails via our phones. As before, Veto chases a goat as we walk up the road. When we are up there, we hear a whale breathing, we must be a few hundred metres at least from the water, so this is quite amazing. Must be funneled up the cliff face. When we come back to Catlypso, we see a large humpback whale fin flapping out behind us. It may have been the same whale we heard earlier. Michael then checks the rear starboard bilge to see if there is any water in it. There is none. We are rapidly coming to the conclusion that the water is getting in through the ladder connections (later found to be wrong). We will look at fixing this when we go to The Boat Works at the Gold Coast in a few weeks time. Around 1630 three yachts come in from the north. There is also a stink boat here now, anchored too close to another boat. Another mono comes in from the south a bit later. We have showers and at 1645 we go to shore again and have sundowners. A few other boats come in as well. Mark from Trim the Cat (yes, named after Matthew Flinders' cat and it is a catamaran) and Scott and Col from Sundowners are the main ones we speak to. Some others come in but do not really join in with us. A bloke off the catamaran in the lagoon comes around for a while. 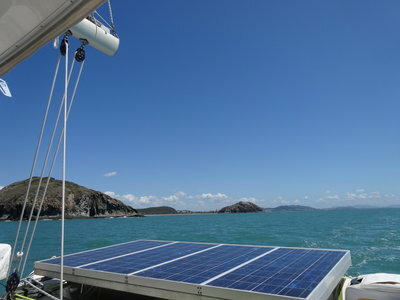 It does not have a mast and we learn that it broke off in the Whitsundays! Bugger! We have a few drinks with Mark, Scott and Col and then cook a barbecue. Kelly and I have some nice minute steak and Scott and Col cook a fish they caught today. We head back to Catlypso at 1915. A nice end to the day. At 2015, Sundowners pulls up its anchor and leaves, they told us they were not going to go till 0400. It was calm for most of the night, only a little rocking and rolling a few times. We get up at 0500, make tea and coffee and head out. We pull up the main sail before we leave and once south of Middle Percy Island and on the track for our destination, we pull out the genoa. 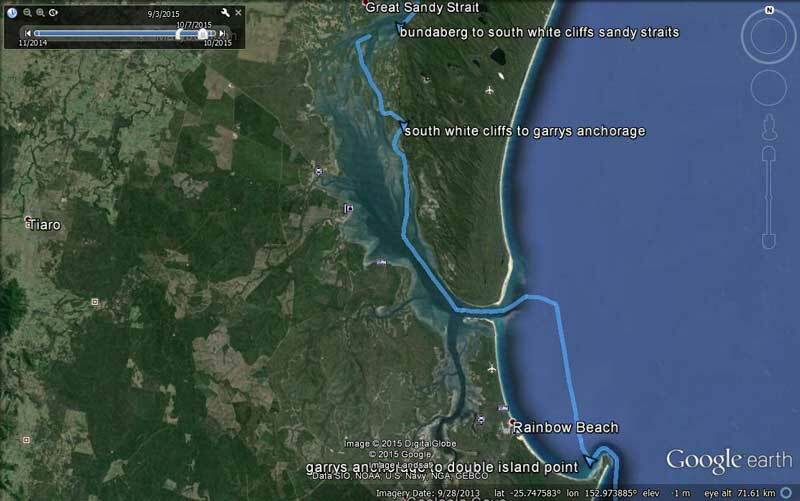 Our plan is to go to Island Head Creek which is in the Shoalwater Bay Military Training Area, or if possible, Port Clinton. The wind is about 30 degrees off our port bow, this is the closest we can sail to the wind with the genoa (we can only do 60 degrees with the screecher). The wind is 15 knots at first but soon drops to only 10 knots, so we have to motorsail or else we would be doing less than 3 knots. It is 50 nautical miles to the closest place we can anchor overnight, so we need to average about 4.5 knots if possible. The wind changes direction a lot, sometimes by as much as 20 degrees. It goes south so much we to have pull in the genoa. We are make about 4.4 knots with one engine and the main sail. We see quite a few pods of whales, today will be the best day we have had on this trip so far for the number we see. Michael decides to try out the DSC (digital selective calling) feature on the VHF radio. He programs in the MMSI number for Trim the Cat and calls Mark. He selects a channel to use, then uses the buttons to send a request to Trim the Cat for a call. This sends a message to his radio via channel 70 and sets off an alarm on only his radio and asks if he wants to accept the call. When he does, it changes his radio to the channel Michael selected. They can then talk. Mark and Michael discussed this at drinks last night, so it is good they have used it for the first time. The swell increases towards lunchtime, there is at least a two metre south-easterly swell, but only about half a metre chop. It is not too bad. A few of the other boats that were anchored with us last night have also left and a couple have passed us already (monohulls motoring). 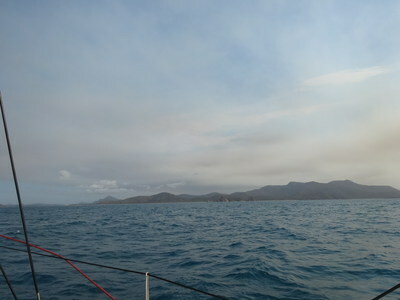 The wind increases just before noon to 17 knots and looks like it may get stronger so we pull in the genoa. The wind drops again to 15 and then 12 knots, so we put the genoa out again. We are lucky that we can motorsail like this on the heading that we need to sail. Trim the Cat (who left at 0300) has sailed nearly all the way and must tack many times to make it to Island Head Creek. As mentioned, today we see many humpback whales. About 1500 we see a pod of at least 10 a few hundred metres off to the west. They are breaching, fin slapping and more. We see that they are going to go very near the boat behind us (Koonya) so Kelly calls them on the radio to warn them. They had already spotted them and were trying to get photos! Just before 1600 we enter Island Head Creek. 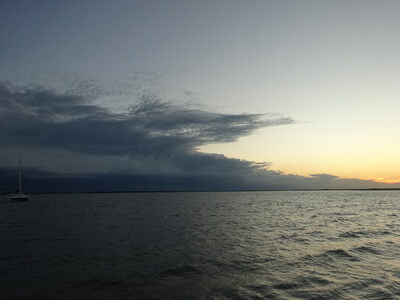 Although we probably could have made it to Port Clinton before sunset, we have had enough for the day. 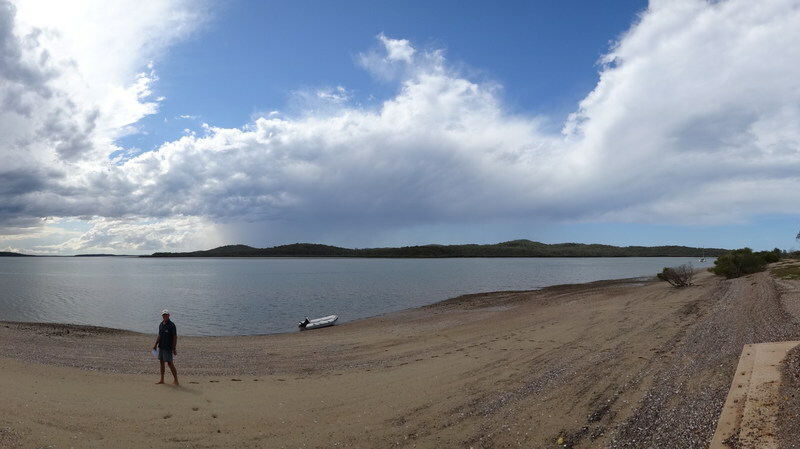 We end up anchoring off the western beach at 1640 after first examining a bay (it was far too shallow). Just after anchoring (but before the engines are turned off), Kelly says she can hear a dripping from the fuel tank. Michael investigates and it turns out it is the fuel return line. It seems that this line must be submerged in the fuel when the tank is over about 50% full so it makes no noise. Michael adds 66 litres of fuel from containers and we have about 153 litres now in the tank. We take Veto to the beach, she has not been to the toilet since last night. We try to encourage her to go on the back deck but she rarely will, preferring to hold on. When we get back to Catlypso, Trim the Cat is coming into the anchorage. We invite Mark over for dinner but he says he will come just for drinks. 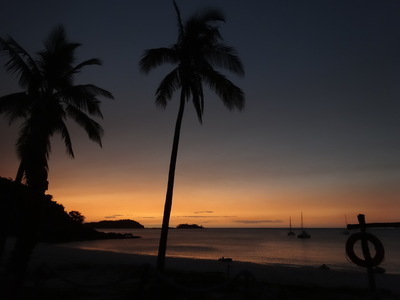 We quickly have showers and set up sundowners and Mark comes over soon after he anchors. We have a good talk about many things and he heads back at 2000. Kelly has made a green chicken curry and we have this for dinner. It was very calm overnight and when we get up at 0710 it is quite still. 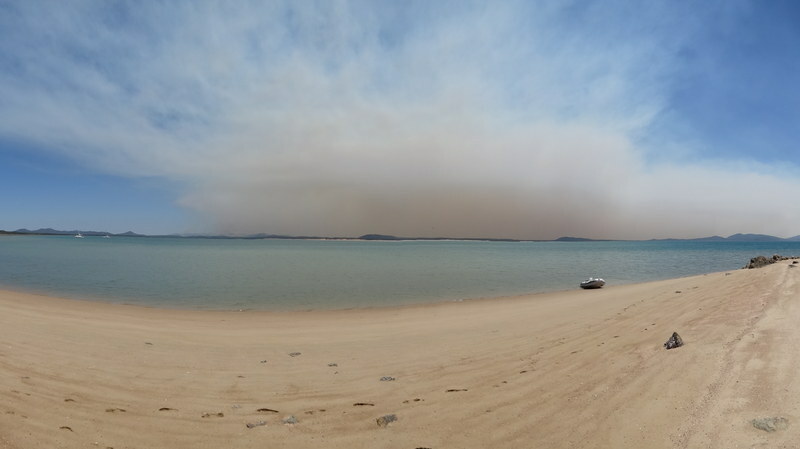 There is a lot of smoke around from a bushfire. We make tea and coffee and decide to leave, even though we were originally going to stay here tonight. We figure we will go to Port Clinton so that the next leg to Yeppon is much less. We leave at 0740 (after calling Mark on Trim the Cat to let him know we are leaving). We motor out of the creek and once outside, we pull out the genoa. There is 12 to 15 knots of wind once outside, but it is a close haul so we do not get a great benefit from it. We are sailing with it at 30 degrees to our starboard. With one engine on at 2000 rpm we are making about 6 knots. There is a large swell still, but the sea is smooth. At 0915 the wind goes south-east and increases to 17 to 20 knots. We can no longer use the genoa so we pull it in and motor. Once we round Delcomyn Island, we can pull out the genoa again for the run into Port Clinton. As we enter we pull it in as the entrance is quite shallow, coming up to less than 4 metres in spots (tide was about 1.6 m above total low). 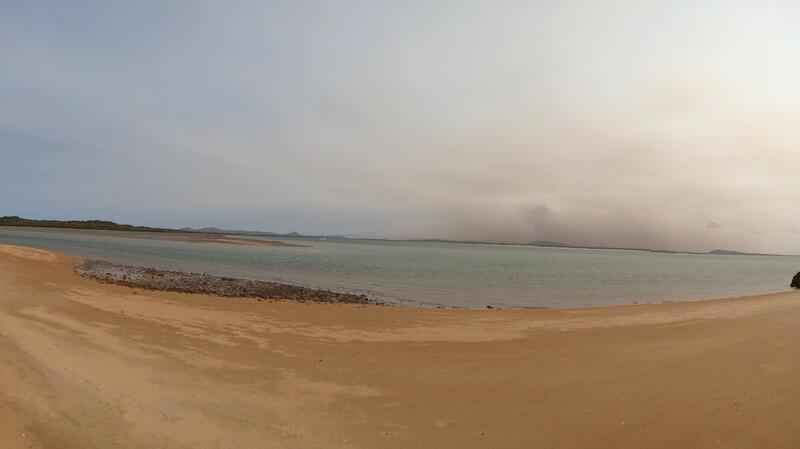 We motor in and have a look at one beach, the water is 45 metres deep just a short distance off but it only gets shallow very close to the beach. Probably not a great place to anchor considering the forecast for tonight is a very strong south-easterly. 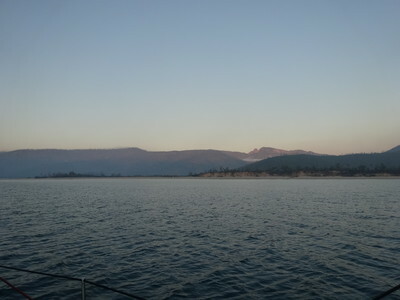 We end up anchoring at 1100 off a very shallow bay on the eastern side. There is a Manta 40 catamaran, Amada from Florida, US, near us. Surprisingly, we have not only mobile phone coverage, it is very good. Michael ends up updating the website with photos and our blog for the past five days or so. We then take Veto to the closest beach for a run as she did not get to the beach this morning. 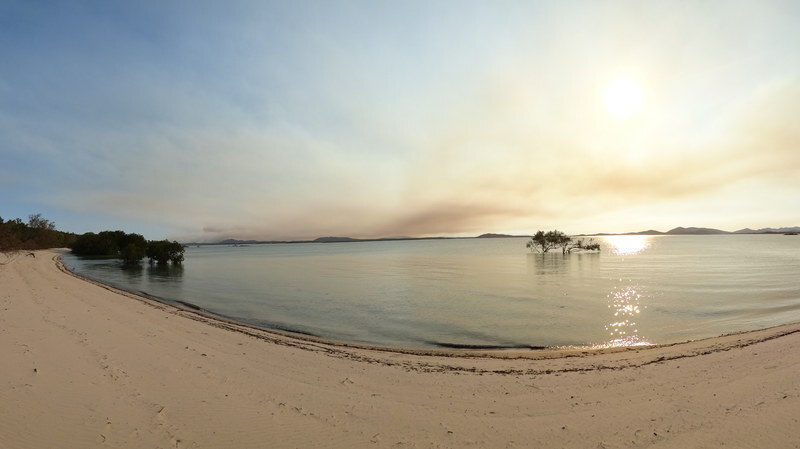 We now know where the smoke is coming from, there is a large bushfire burning on the southern end of Port Clinton. It is moving into the wind so is not a major problem. We even have some burnt embers fall on the boat later in the afternoon. See the photographs above and below. After lunch, Michael has another look at the watermaker pump, this time adjusting the spring that he fitted to the motor bush. He then runs it to flush the watermaker with freshwater, the pump does not make the noise it has been making, but it also does not seem to be pumping at the right pressure. We also check the starboard rear bilge and as expected, it has a lot of water in it. This almost certainly confirms our suspicions that the water is entering via the ladder fixtures. By now the wind has dropped to less than 10 knots and it gets even less as the afternoon and evening goes on. At 1600 we go to the beach again, this time one a bit further to the north. When we get back to Catlypso, we see some small dolphins at the back of the boat. There are also a few turtles here. We have showers and then sundowners. Earlier, Kelly makes a masaman beef curry for tomorrow night (we took too much steak out of the freezer two days ago) and marinades pork spare ribs. Michael later cooks these on the barbecue. 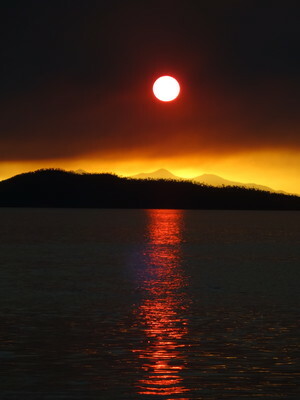 There is a brilliant sunset tonight, we have already had quite a few, but this one is made better by the smoke from the bushfire. The anchorage here is affected by current and this is the primary thing that determines which way we hang. The current is stronger than the wind, so we are facing into the current. No problem at the moment, but if the wind does come up like forecast, then after midnight we may have an uncomfortable night. We intend to stay here till Friday morning and then head south again. It was not too bad overnight till about 0230 when we had wind at 90 degrees to the tide. This rolled us around for 90 to 120 minutes and we do not get much sleep during this time. After this it was much better. We sleep in till 0730 but do not get up till 0900. Michael takes Veto to the beach, it was a very rough trip there and back, things we do for our children! We have breakfast and then read. We certainly have read a lot of books on this trip. After this Michael calls Mark from Trim the Cat using the DSC on the VHF radio. He is still in Island Head Creek (we cannot always see his AIS signal). After this Kelly does some on-line food shopping to be delivered to the marina in Rosslyn Bay on Saturday morning. Michael adds another 44 litres of diesel to the fuel tank to give us 75% capacity. 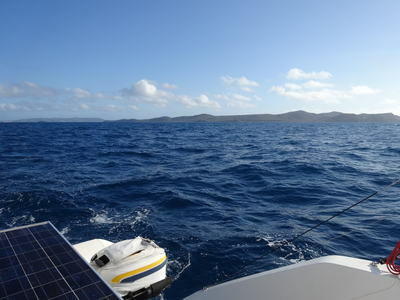 After lunch we take Veto to the beach again, it is still quite rough as the wind is 17 to 20 knots. When we get back, we check the starboard rear bilge again, there is no water since yesterday, confirming our views it must be coming in via the top of the rear transom. Michael calls Mark via VHF to tell him the wind had gone a bit more to the south-east (from the south) as he said he might sail down here if it went east enough. He decides he will not leave Island Head Creek till tomorrow. After this, Mark calls us back using DSC, but Michael does not answer correctly the first go as he has never done it before. We work it out and the second and third attempts work. Mark then sends us a position request which we answer (this plots us onto his chartplotter as well). We then send him one and he answers back. All of these are done digitally and the GPS co-ordinates are sent automatically from the VHF radio once you push a button to respond. These are great safety features that most users do not know how to use. We go to the beach again later, the wind is still not good. Michael has a quick shower using the luke warm water left from yesterday. He copped a lot of saltwater over him during his three runs to the beach today. We have sundowners and the masaman beef curry Kelly made yesterday. The wind finally drops about 1815. Tomorrow we plan to leave about 0600 and motor and sail to Rosslyn Bay Marina. If the weather forecast is accurate, it should be a reasonable run. 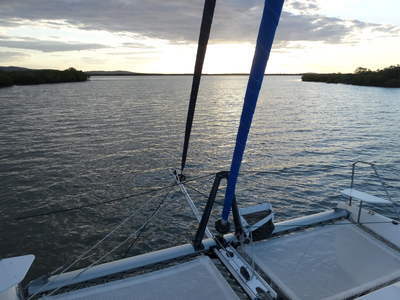 It was mostly calm overnight with the wind only 5 knots or so. However, it got a bit sloppy about 0430. We get up at 0530, make tea and coffee and leave at 0550. As we motor out two humpback whales frolic around near us. Once outside we pull out the genoa and motorsail. We are doing 5.7 knots in an 18 knot easterly. The seas are very sloppy. As we approach Cape Manifold, we pull in the genoa as the wind goes south-east. 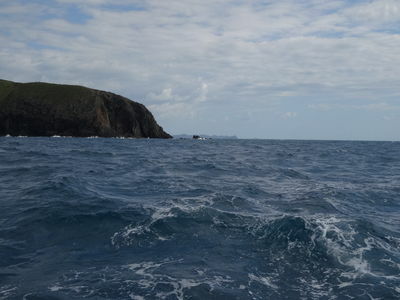 It is also very rough here, as the current increases to 2 knots going north with the wind almost opposite. We are making only 3 knots at the most. Once we pass the island off the cape, the seas calm off a lot as the current drops. We put the genoa back out as we are heading more south now. We motorsail close-hauled and make over 6 knots in a 12 to 20 knot wind. The wind drops a bit later to 15 knots and we are still doing 6 knots. It has calmed a lot, but there is still a slight chop. The last 9 nautical miles are very shallow, 8 metres or less. 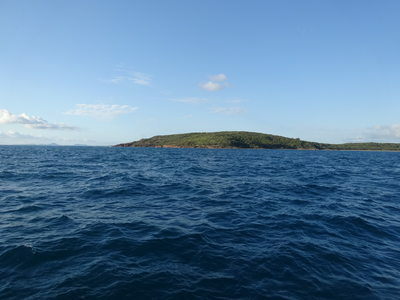 As we approach Rosslyn Bay, we hear Reality II calls Round Hill and Gladstone VMRs. 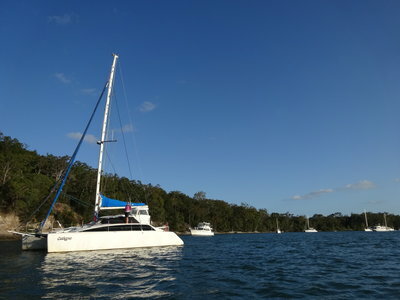 This new Seawind 1160 Lite is owned by our dive buddy Mark Ridsdale. 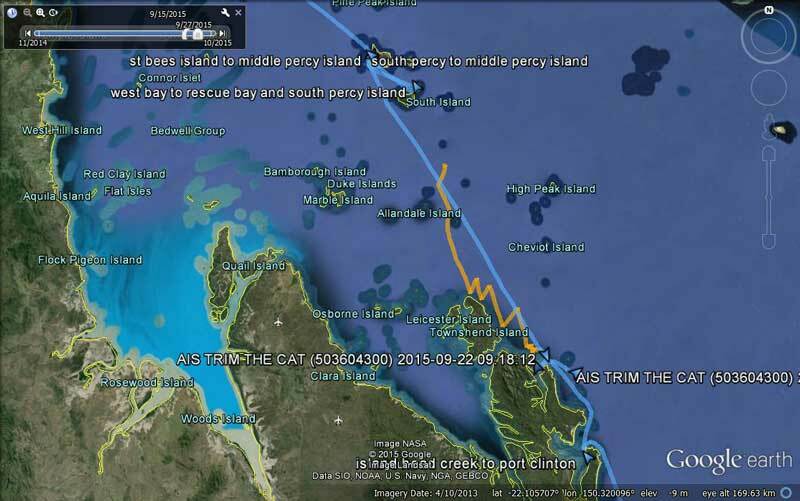 He is still heading north and is on his way from Lady Musgrave Island to North West Island. We call him on the VHF and have a chat. At 1415 we tie up in Rosslyn Bay Marina. While Kelly goes to pay, Michael takes Veto for a walk. After this Kelly puts on some washing and we then both take our five empty diesel containers to the petrol station which is only a short walk away. We use the marina's trolleys. 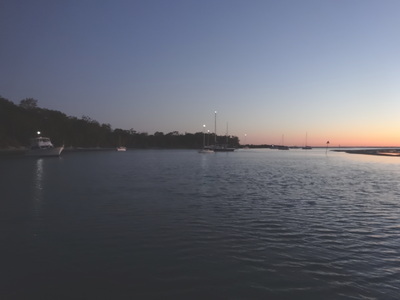 The fuel wharf is not part of the marina and it is not all that convenient to use. 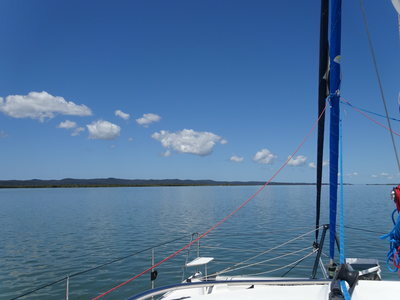 On the way we drop into the Capricornia Cruising Yacht Club to see if they have dinner tonight. They do, so we book in. We buy 110 litres of diesel ($148) and walk back to Catlypso, dropping in to put the washing in the dryers. Kelly later gets the washing from the dryers. We have our first long shower in nearly four weeks, luxury. At 1750 we walk over to the yacht club. This is dog friendly so we take Veto with us. The club is run by members, they staff the bar and cook the food. Dinner is roast beef and vegies and bread and butter pudding, all for $15. The beer and wine is also cheap. It is a nice evening. When we get back to the boat we watch the NRL semi-final, Brisbane versus Easts. Brisbane kill them. It is pretty windy when we get up at 0745. The only reason we get up so early is because the Woolworths delivery bloke has arrived. We have breakfast, flush the watermaker and empty the rear starboard bilge again. The rear starboard water tank is now empty, meaning we have used about 210 litres in 12 days, that is about 17.5 litres a day. While Kelly fills the water tank and washes the boat, Michael goes to the petrol station and gets another 44 litres of diesel. We now have a full tank and 110 litres in containers. Kelly also cleans the inside of the boat a bit. We leave at 1030 and once outside we motor as the wind is on the nose. 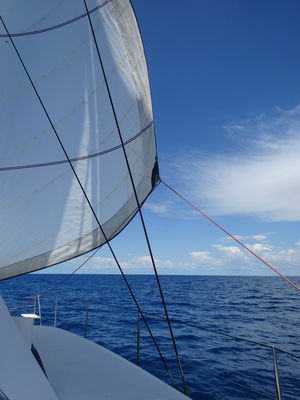 However, a bit further out the wind changes to the east and we raise the main sail and pull out the genoa. We sail for about 25 minutes but then have to motorsail as we were going too far to the west trying to keep the wind. The engine is on and off for a while. The wind increases to 15 to 17 knots and we are sailing again at 6 to 7 knots. A bit later the wind increases to over 20 knots so we drop both sails and pull out the screecher. We are doing 5 to 6 knots and the wind drops back to 15 to 17 knots. The whole of today's sail is in shallow water, less than 8 metres and one bit of 2.3 metres and another of 1.9 metres. We swap back to the genoa to skirt the second shallow bit. 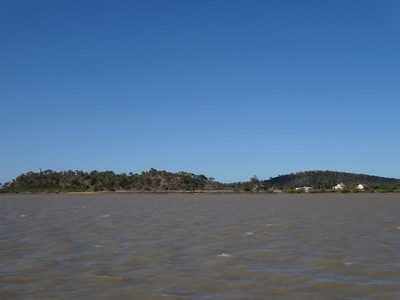 It is very sloppy in the channel leading to the Fitzroy River. We sail the last bit right past Sea Hill Lighthouse and the old pilot station buildings, finally dropping the sail at Maria Inlet. We motor the next section of The Narrows. 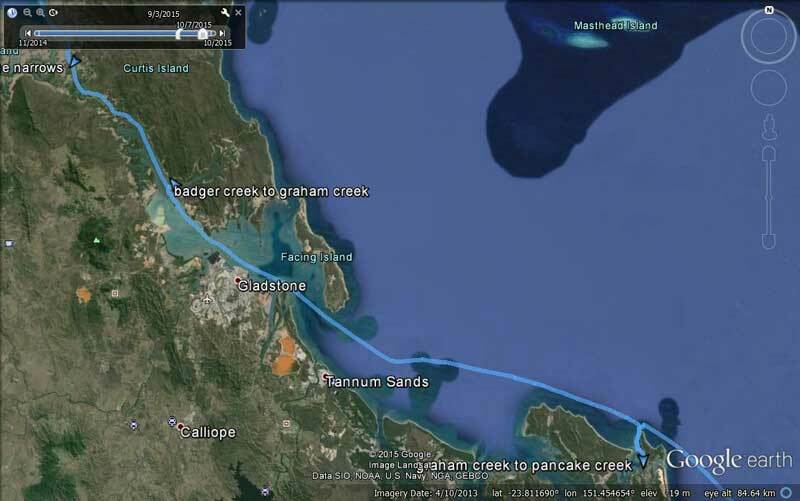 We can see via AIS that Mark in Trim the Cat is anchored in Badger Creek and this is where we plan to stop too. We call him on the radio and find he is the only one there. We motor into the creek. This is pretty deep, over 5 metres for at least 200 metres. We go past Mark and anchor in about 9 metres. We have to anchor again as we drag back a bit, but then we end up with our stern only five metres off the shore. We pull up the anchor again and go west of Mark and anchor again. This time we are happy, it is 1700. 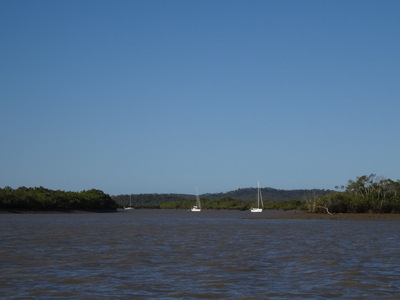 The creek has very steep sides and is bounded by mangroves. There is nowhere to take Veto for a pee, this is potential crocodile country. Later, Mark comes over for drinks. After he leaves, we have chicken and leak with spaghetti. It was very calm during the night. At low tide Kelly called Michael to come outside to look at the creek. Under the almost full moon, the creek sort of looked like a canal, as the sides are so steep and the tidal variation so high, it makes a very spectacular view. We get up just before 0700. It is almost high tide and the water goes over the top of the creek's banks. Mark leaves at 0705 and we make tea and coffee and then depart at 0735. We motor out into the main channel and head south. We pass another couple of spots where you can anchor and then come to the section of The Narrows that is totally dry at low tides. You can only transit The Narrows in a short period either side of the high tide. In addition, due to the strength of the tidal flows, you want to approach the middle section that totally dries right about high tide. As we motor, we have up to 2 knots current behind us. We pass two yachts coming north, luckily this was in a wider section of the channel. In some spots it is very narrow and I would not want to have to pass another boat in these places. We hit almost 7 knots in spots and the shallowest part we cross is about 1.9 metres. In these places we are going over spots that are over 2 metres out of the water at low tide. 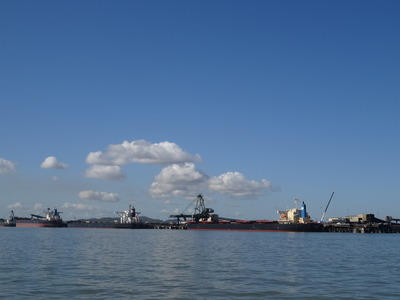 The shallowest section runs for about six nautical miles long. 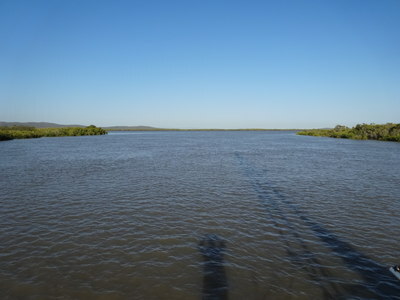 On one of these sections there are two crossings where cars and cattle cross from Curtis Island to the mainland. There are even fences that go across the channel, now totally underwater. There are a couple of leading marks to indicate the channel as well as a lot of red and green channel markers. The tide turns about 0840 which is about 20 minutes late according to our information. 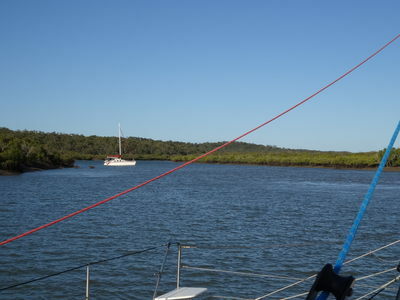 We end up anchoring in Graham Creek at the southern end of the channel, just on the northern side of Gladstone at 1000. 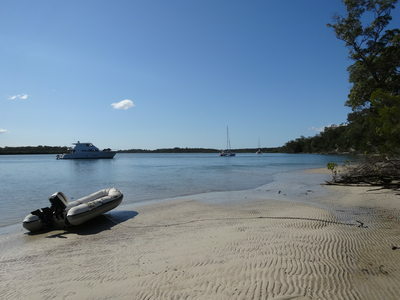 It is 8.6 metres deep where we anchor, with about 3 metres to drop to low tide. 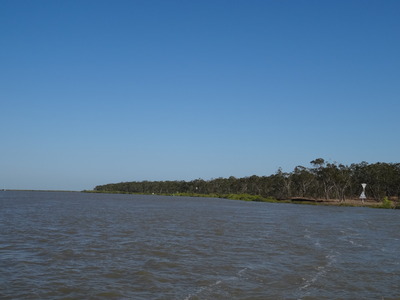 This is a very large creek, quite wide and also long. We anchor near the entrance and a beach. There are a few bugs around, but it is not too bad. We take Veto to the beach, she has not been off the boat for over 24 hours and has not peed in that time. The beach has the remains of a boat ramp, strangely made from plastic cliplock type pieces. 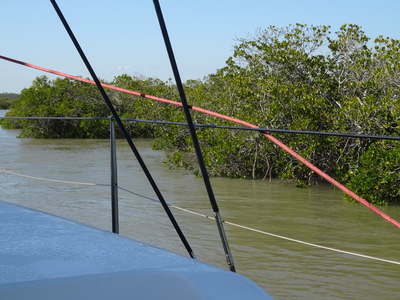 When we get back on Catlypso, the tide is really flowing out, it reaches over 2 knots. About 1200 we spot a large thunderstorm approaching from the south-west. We can hear the thunder for a long time. As the storm gets closer, it dissipates a fair bit. The lightning is never seen, it must be totally contained in the clouds. We get a bit of rain, but not too much. By 1330 the storm has passed us and we are relieved. Michael makes some pikelets, something he used to do as a child on Sunday afternoons. We later have some with afternoon tea, yummy. We take Veto to the beach two more times so she can have a run around. We read a lot, check the starboard bilge for water (some) and a few other things. 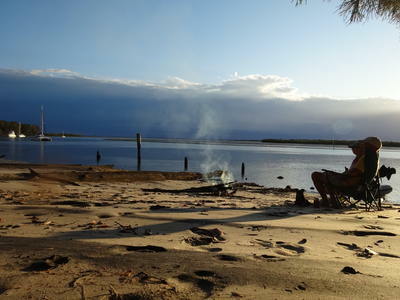 We have showers, sundowners and then have lamb rissoles with potato bake. It was very calm overnight. We get up at 0620 and Michael takes Veto to the beach. We make tea and coffee and at 0700 we head off out of the creek. 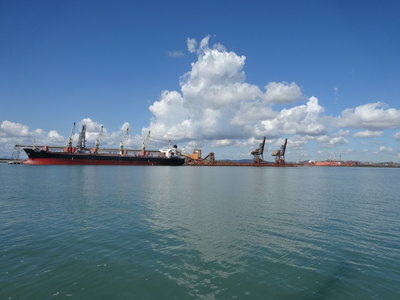 We are now entering the Port of Gladstone and as such, we have to contact the port control (VTS). We are informed that there is one incoming gas tanker that we have to keep clear of. Our plan is to sail to the town of 1770 (named because James Cook landed there in 1770). We cut across from the main channel into a minor one, at least that is how it is shown on our chartplotter. However, it is obvious that this is now a new channel, dredged to 16 metres and with lots of navigation aids. We motor down it, doing about 4 knots into a knot or more of current. 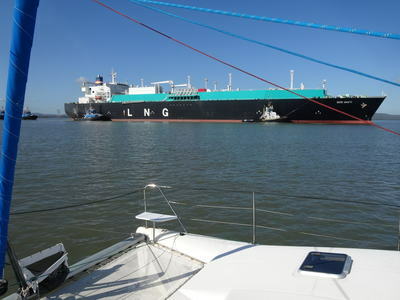 We pass the new liquid natural gas (LNG) plants and loading wharves. A bit further on from here we see on the AIS that the gas tanker is coming near us. We move out of the narrow channel into the area between it and the new industrial areas. This is still quite deep. The tanker is huge, with four tugs manoeuvring it. We continue motoring, past coal loader after coal loader. 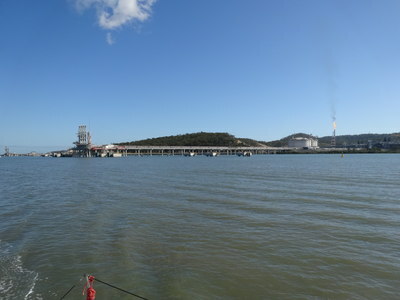 We pass the marina area and then the aluminium refinery. Finally, after 2 hours and 45 minutes we have left the industrial area behind. We are still in the shipping channel though. Two catamarans, Catalina and Flina motor past us. 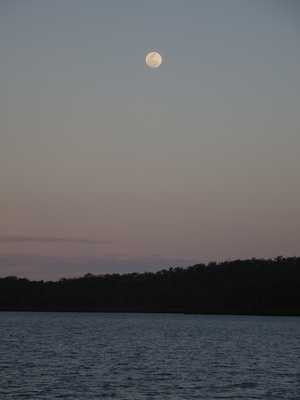 They have come out of the marina and we first saw them over four months ago in Garrys Anchorage on Fraser Island. 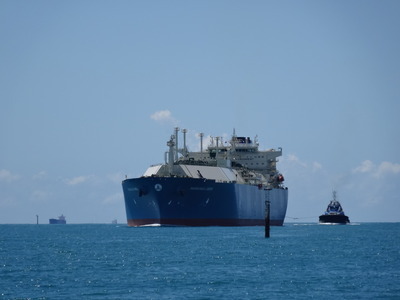 Another huge gas tanker comes down the channel. We have already exited the channel on the southern side (as planned) on our heading, but for some reason Flina exits to the north and seeing the tanker, turns more to the north to go behind it. We are pretty sure that they then ran aground as they stopped dead, then eventually turned at right angles and motored south till around the shallow section (clearly marked on our chart). Anyway, finally at 1100, after four hours motoring, we are out of the channel. We pull up the main sail and then the genoa and start sailing. We swap the genoa for the screecher as the wind is over 60 degrees to our port. At 1200 we are doing 6 to 7 knots in 10 to 12 knots of NNE wind, with 1 knot of current to our advantage. At 1240 the wind goes back to the north-east so we swap back to the genoa. We are doing 6 to 6.5 knots in 13 to 15 knots. There is a big thunderstorm off to the south and the weather radar shows it is heading right at 1770 and across our path. We decide to change our destination from 1770 to Pancake Creek so we avoid the main part of the storm. At 1440 we pull in the sails and motor into the entrance of the creek. As with our last time here, the chartplotter is useless, our track goes right through the headland. 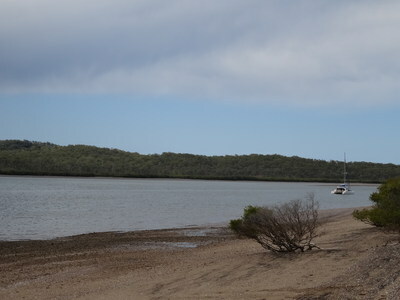 In addition, it is almost low tide of 0.1 metre. To make things worse, the rain starts and it pours making visibility very poor. While Michael steers, Kelly goes to the navigation table and guides Michael by watching the plot of our previous trips in and out on our Google Earth display on our laptop. We have a minimum of 0.9 metres under our hull (meaning the water is 2.0 metres deep). We end up anchoring at 1515 a bit further south than last time with 2.0 metres under us. 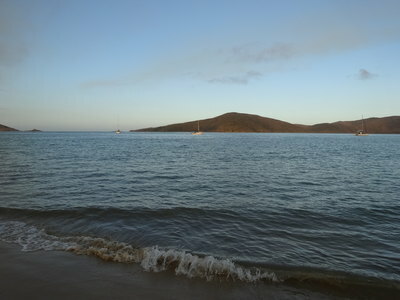 After ensuring that we are properly anchored once the tide changes, we go to the sandspit and have a long walk. After this we drop by Wind Falls owned by Michelle and Peter from Newcastle. We met them in Butterfly Bay. We stay for quite a while discussing many things. We are back on Catlypso by 1725 and have showers and then sundowners. Kelly makes meatballs and spaghetti. 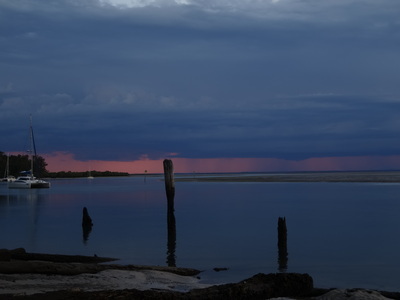 Tomorrow we will have a longer day than we originally planned as we need to go from here to Bundaberg. It is about 64 nautical miles, so we will have an early start. If the wind is like today, we should make have an easy run. Another calm night. We get up at 0520 and Michael takes Veto to the sand spit for a run. Kelly makes tea and coffee and at 0550 we up anchor and motor out. It takes about 30 minutes to get right outside the creek, at least today it was easier, the tide was higher and we could follow yesterday's track on the chartplotter. At least another 14 yachts head out either before or just after us, all heading south. Once outside, we pull up the main and pull out the screecher. We motorsail for about 25 minutes and then sail in 12 knots of wind. 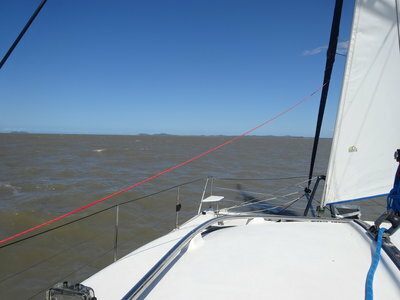 We are doing almost 5.8 knots, above the average we need to make to get to Bundaberg before dark. 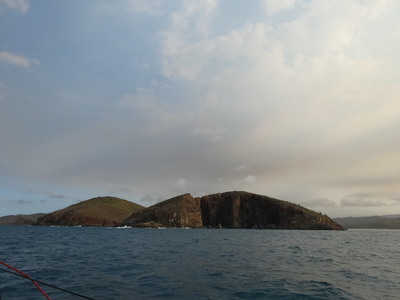 We pass between the rock south of Middle Rocks and Inner Rocks. All but one yacht uses this track. When we pass the rocks we need to turn more to the south and the wind also drops and moves to almost northerly. We have to motorsail again, basically we have an engine on for the rest of the day apart from a couple of very short periods. The tide turns at 0930 and we have a slight assistance from then on from the current. At 0950 three RAAF F18-A Hornet jet fighters fly past us, they are about 100 feet off the water and one is only a hundred metres or so from us. Spectacular! We had heard on the radio news this morning that they were doing low flying all along the Queensland coast this week. 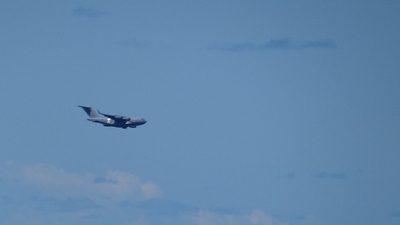 Later we see two more and then a huge C17A Globemaster cargo plane crosses over our path at 500 feet or so heading for the coast. The wind goes from 12 to 15 to 17 to 12 to 22 and so on all day. In the end it is almost behind us, so we do not get that much out of it. For the last hour we drop the main and just use the screecher and go a bit better. 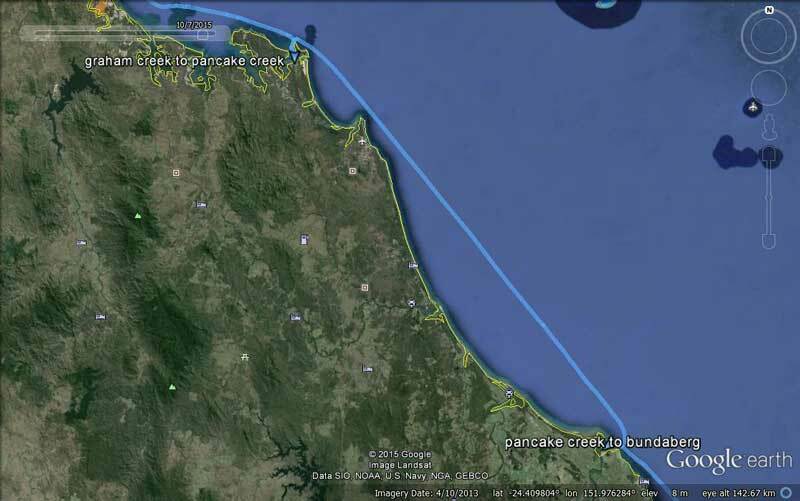 Not all of the yachts that came out of Pancake Creek go into Bundaberg, some head for Hervey Bay. 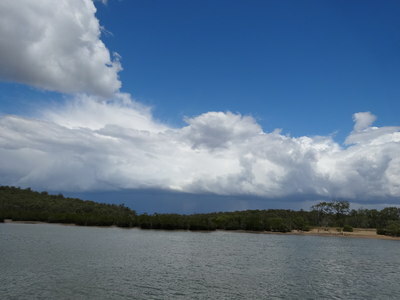 As we enter the channel into the Burnett River, a few things happen. We pull in the screecher and then there is a huge bang. It takes us a few seconds to work out what has happened. The boom is hitting the bimini over the helm. It seems the topping lift has broken and the boom dropped. Kelly secures the boom to stop it swinging. Meanwhile, on the radio we hear that someone on Pilgrim has badly cut themselves on coral (we later learn that this was not what actually happened). We assumed they must be out at Lady Musgrave Island but later (2017) learn that it was at Fitzroy Reef. It looks like the person is being transported back by the passenger ferry to be collected by paramedics. There is a report of a yacht losing its mast off Gladstone and a ketch getting into trouble on the Wide Bay Bar. This latter one is later said to be okay, we are not sure what happened. What an afternoon for trouble! 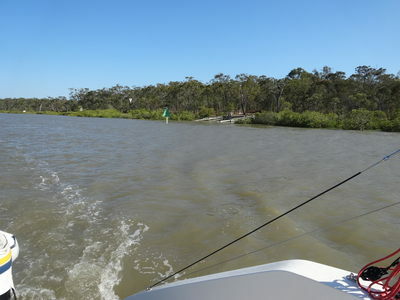 We motor into the river and at 1650 anchor on the southern side between Burnett Heads harbour and the main marina. This is where we stayed on the way up. It is well protected, even though we have 17 knot northerly winds. Later the wind drops to almost nothing. After we anchor, we find that the topping lift problem was caused by the D-shackle pin coming loose and then the shackle straightening out. Michael repairs the shackle by bending it back into shape (since we do not have a suitable spare to use). We refit it and lift the boom back to the correct height. Michael then takes Veto to the beach across the river from us. When Michael gets back it is already 1730 so we have sundowners and then dinner, left over lasagne (frozen from last time we had it) and Asian entrees. At 2030 the wind increases dramatically from nothing to over 20 knots and is from the south. 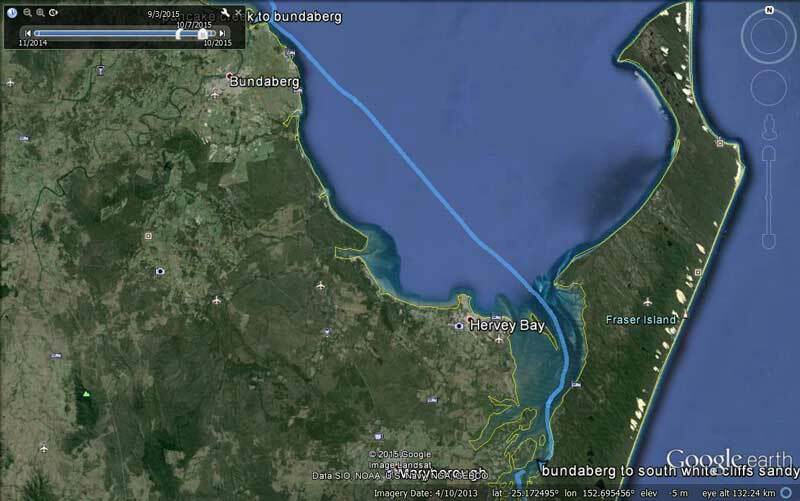 We hope that the yachts that continued on south have reached Hervey Bay, but we doubt it. 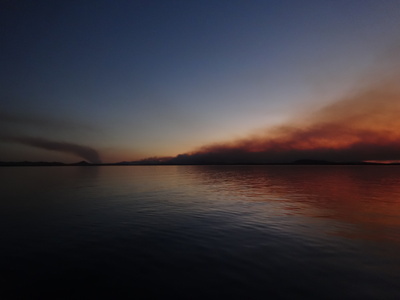 We have been lucky with anchorages the past week or more, last night was no different. Very calm. We get up at 0530 and Michael takes Veto to the beach while Kelly makes tea and coffee and gets other things ready. We leave at 0555 and motor out the channel. As we leave, there are four other yachts heading out and Pilgrim coming in. You will recall from yesterday that the owner was badly cut (we thought on coral but was hit by a dinghy) and they were evacuated. 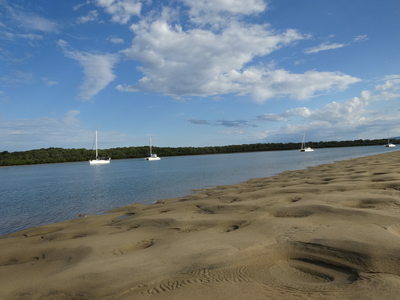 It looks like they must have brought the person to Bundaberg and this is why the yacht is now here. Once outside we pull out the screecher. The wind is from the south at 6 knots rather than the forecast north or north-east. We motorsail at about 6.3 knots. 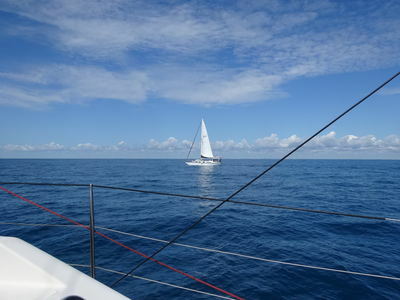 The wind moves a bit more to the east so we swap to the genoa and maintain our speed. 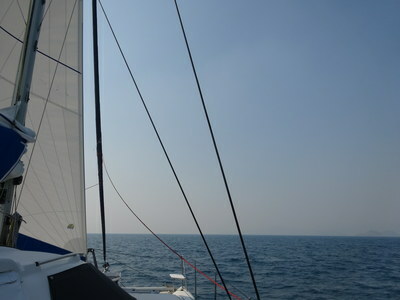 The seas are very flat, as calm as we have had for the trip. At 0800 the wind goes south-east so we have to turn a bit to port to keep wind in the sail. Our speed drops to drops to 5.2 to 6.2 knots and soon after we try tacking to see if we can go better. We do not, so we tack back to the same course and then decide to drop the sail altogether and just motor. We keep the same approximate speed of 5.5 knots. At 0900 we spot a turtle shell on the surface, it looks like the turtle has died as it is just floating there, no head or flippers are visible. By now the wind is on the nose. We pass a mono called Te Wero soon after and have to dodge a lot of buoys, probably lobster pots. Catalina passes us about 1100 but the is no sign of their normal companion, Flina. Around 1120 the wind finally goes to the north so we pull out the screecher but we get no increase in speed (the wind is very light). 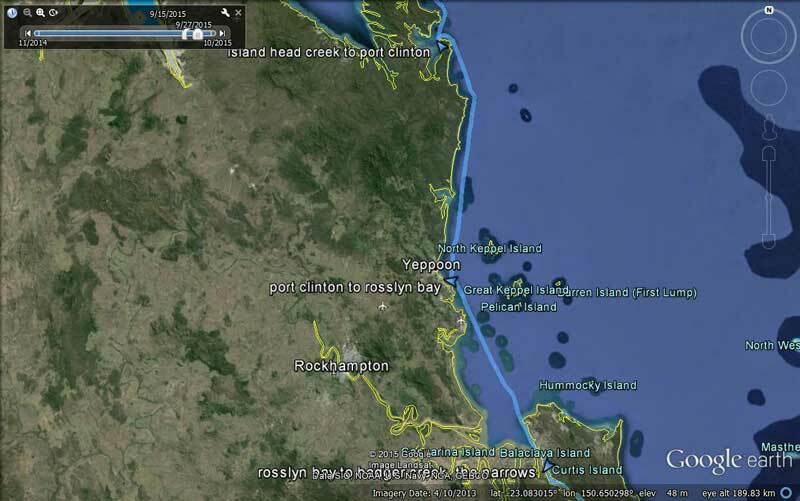 Kelly logs on with Hervey Bay VMR and then off with Bundaberg VMR, it is really annoying that they do not pass you on as happens in NSW. We pass the fairway beacon that marks the entrance to the Great Sandy Straits at 1200. From here it is a long and slow motorsail as the tide is now outgoing, slowing us by 1 to 2 knots. We have the wind behind by now, but this is not enough to overcome the tide. We are making only 4 knots give or take. A few hours later the wind increases to 22 knots but this is not good, as it makes the outgoing tide stand up and we have to bash into very short and sharp waves. This seems to go on forever as we navigate our way down many different channels. 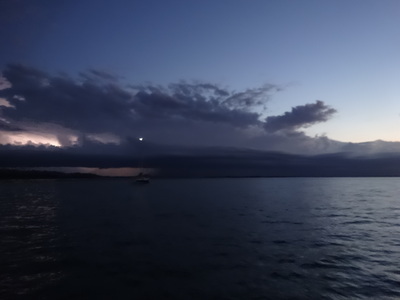 Our original intention was to anchor off one of a couple of islands near South White Cliffs, but as we get nearer it is rapidly approaching 1800 and sunset. To make things worse, the last bit would be straight into the setting sun. We decide instead to stop at South White Cliffs. This will not have as much protection from the predicted northerly winds as the other places. By the time we get here the wind has dropped to about 10 knots, so it is relatively calm. We motor right to the end of the South White Cliffs anchorage, past a whole bunch of stinkboats that all came roaring past us and who seem to be part of the one group. We anchor at 1745 in 5 metres near a few other yachts. There is another thunderstorm off to the south and south-west, the fourth day in a row we have had them around. It is now too late to take Veto to the beach. We have sundowners and showers and then Michael cooks a flat lamb on the barbecue while Kelly does vegies in the oven. The wind drops to about 2 knots but at 2115 it goes up to 10 knots from the south-west and then even stronger. The wind hits 22 knots and this is in the exact opposite direction to the incoming tide. We move forward under the influence of the wind, it drops, then we go back under the tide. The anchor alarm goes off consistently till we change it to 0.03 nm instead of 0.02. It is very rolly. This did not stop till the tide changed at 2315 (it should have been 2245). South White Cliffs at top, Double Island Point at bottom. Garrys Anchorage where it says "south white cliffs to garrys anchorage"
It got very rolly again during the night (we cannot remember what time it was) when the wind went northerly and blew about 20 knots. This did not last too long, but it was very uncomfortable as the wind was 90 degrees to the tide. We get up at 0800, our first sleep in for five days. We go ashore, the first place we tried, Michael sank down to his knee when he tested the bottom off the mud beach. After this we go back to Catlypso for breakfast. Today's movements are linked to the tides as we need a highish tide to pass over a section of the Sandy Straits called "The Shallows" and also to give us current behind us. Catlypso anchored at South White Cliffs Passing through "The Shallows"
All the large stinkboats leave as we have breakfast, eight of them heading south. They are in two groups, one of two and the other six boats. We hear them discussing fuel economy, one says he is using 115 litres an hour and worries that the 1100 litres he has on board is not enough to get him back to the Gold Coast!! We have not used that much fuel in five months. After breakfast, we flush the watermaker and Michael checks the starboard rear bilge for water. There is not much more in there than three days ago, so we think our idea that it is coming in the ladder fixtures is not correct. Michael looks closely and now thinks it may be leaking in where this section is joined to the main hull. He puts some silicon where it may be leaking. If we get little water on the next few legs, this will possibly confirm this as the right solution. We leave at 1055 and after a short motor into the current to get back into the main channel, we fly along with the tidal current behind us. With one engine, we are doing around 7 knots for most of the journey. 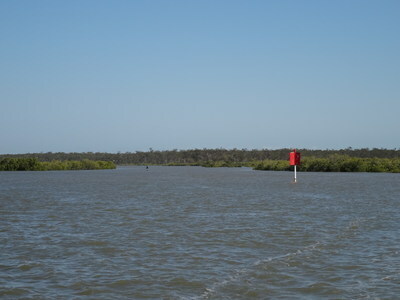 The channel is both shallow in spots, narrow and also quite winding. The channel markers are not always as per our chartplotter, so care is needed. The tide from the north meets at a place they call "The Shallows" and our aim is to get there right at high tide so that when we go past here, we have the outgoing tide behind us. We time it perfectly, we have a 2 to 3 knot current behind us for the whole trip. We are going to Garrys Anchorage. There are two ways in, the southern one is deeper, but we are going in via the northern one. This is the way we came out just over four months ago, so we know it will be okay as the tide is much higher today. We slowly motor in, using the forward looking sonar to assist. The minimum depth is 2.2 metres compared to about 0.3 last time (depths under our hulls). We end up anchoring at 1235 about 20 metres from where we anchored in May. The water is 4.2 metres deep and we are just off the shore. This is a very nice anchorage, well worth visiting. We have lunch and after refurl the screecher as the furling line has again moved around the furler so far we cannot totally furl the sail. This is the first time we have had to do this for months. We also do some clothes washing and then go for a walk. 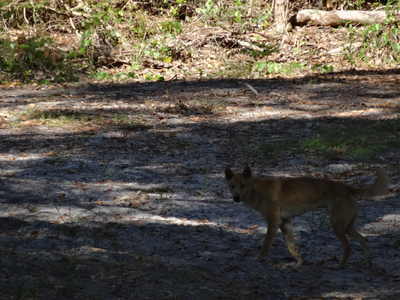 We see two dingos when we come back to the camping area, they just trot past. Back on the boat Kelly does some work while Michael reads. He is now on the second of the Game of Thrones books, probably his 50th book of the trip. At 1630 we go to another beach and have sundowners, with a small fire. Nice, but there were lots of small bugs (midgies?). Another thunderstorm is building to the south-west and we can see the lightning and hear the thunder. We get back to Catlypso at 1800 and soon after we get a little rain. Once again the thunderstorm has missed us. This is the fifth day in a row there have been thunderstorms near us. We have curry lamb and rice and then showers. It is very calm as it has been for all of the day. The weather is not conducive to moving on so we will be staying here tomorrow and then moving a bit further south on Saturday. 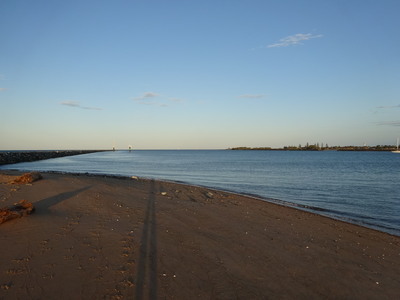 Hopefully we can cross the Wide Bay Bar on Sunday and either head to Mooloolaba that day or the next. It was calm overnight but a southerly of 15 knots is blowing at 0800 when we get up. Michael takes Veto to the beach and we then have breakfast. We are not moving today as we have to wait for a suitable weather window to cross the infamous Wide Bay Bar. Michael cooks some bread and rolls. 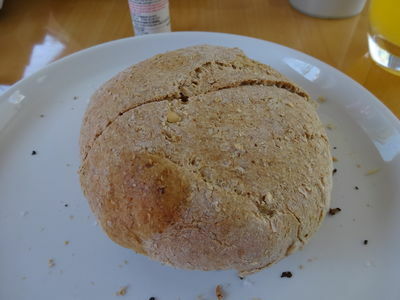 These turn out better than recent efforts, but not as good as bread we have cooked at home. The rolls were great with left over lamb. We see Pilgrim on the AIS come down the main channel and hear them report that they got stuck for a bit. They are probably a bit early. We wonder what has happened to the injured owner. Wind Falls and Koko come in just after noon and after lunch we go for a walk along one of the tracks towards Garrys Lake. We do not get there, but it was a nice walk although very warm. There are a lot more boats here by mid-afternoon, many houseboats and more yachts. In the end there are 15 boats here. Peter and Michelle from Wind Falls come over. We end up discussing VHF and DSC. Michael gives Peter our MMSI number and he will later attempt to contact us via DSC. 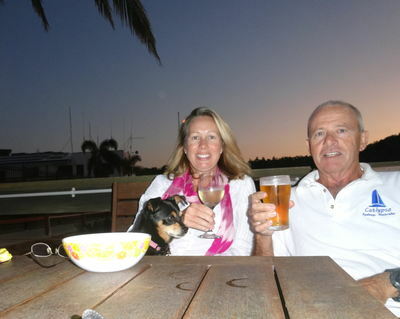 While we are having sundowners Peter calls via DSC. He has worked it all out. When he requests our GPS location, it also plots it on his chartplotter. Looks like Michael will need to work on our system so it also does this. It is great that tonight we have no thunderstorms around, a lot less tension for us. Kelly cooks a pork rack with vegetables. She also makes an apple strudel. Very nice dinner. After dinner there are dingos howling off in the bush. We should also add that there are dozens of turtles around here. There are at least six just in the short distance between us and one of the beaches. There is also fantastic birdlife. A great spot, except for the insects, but they are not too bad. It was very calm overnight but the wind picked up again at about 0800 when we got up. It is blowing 11 to 17 knots. Michael takes Veto to the beach and Kelly gets breakfast. 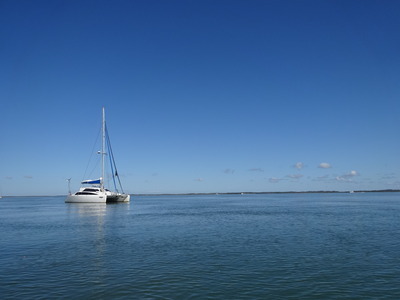 We may leave today to head to Tin Can Bay, but it will depend on the wind and the forecast for the coming days. Lots of boats left this morning and more come in during the day. We go for a walk at 1015, this time to the south. We walk for 35 minutes, trying to get to the creek that we were told about last time we were here where you can apparently swim. However, we do not make it as a check via Google Maps shows that we still had quite a way to walk. We get back to Catlypso just before 1200. We have lunch and Michael has a look at trying to get the VHF radio to output via NMEA to the chartplotter. However, this is not possible as the radio does not have an NMEA out port, only in. Weird! He then works on the Seatalk/NMEA convertor. He has not tried to get this working for ages. The aim with this was to get the Seatalk information from the wind and depth instruments into OpenCPN on our laptop. He still cannot get it to work. He tries to find the company (a small one) that made the convertor but it looks like it might have closed up. Bugger! 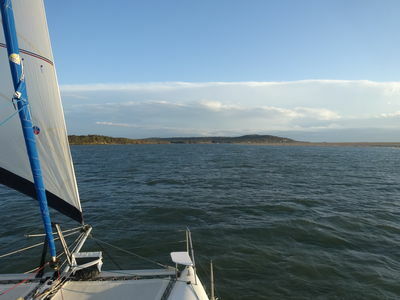 The wind increases during the day and is a constant 17 to 20 knots in the late afternoon. Around 1800 it drops to under 10 knots and by 1900 it is calm. Michael takes Veto to the beach again at 1630 and at 1700, Michelle and Peter from Wind Falls and Elizabeth and Roy from Koko come over for sundowners. 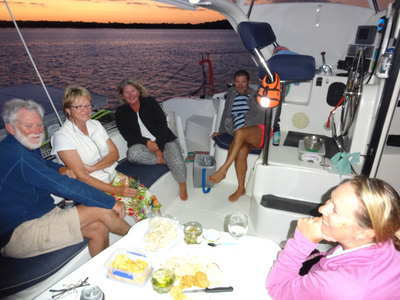 We hear about their adventures and also learn some things about other yachts we have seen (eg one boat has just been purchased and is being taken home south). They leave at 1915 and we have curried sausages and rice for dinner. There are no dingos howling tonight.